If you’re in the, say: Widget Alignment business, you can be forgiven for thinking that your lead generation programs should be laser-focused on finding people who need their widgets aligned. From there, it’s a short and intuitive leap to simply asking people if they need their widgets aligned, or whether they’ve considered the benefits of alignment, so you can help ease their pain. But what of the people who desperately need their widgets aligned but just don’t know they have the problem? Or those that know they need alignment, but don’t consider it a priority? My point is this: in lead generation, and in email marketing in particular – don’t ask people if they have the problem you can solve. Just tell them how to solve it. • Thinking about taking your business global? 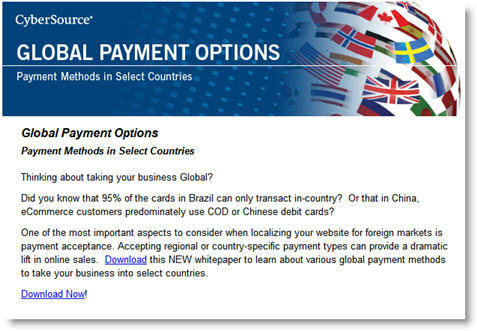 • Did you know that 95% of the cards in Brazil can only transact in-country? and so on. The subject line: “Taking Your Business Global?” (not visible here) is a riff on the same theme. and so on. Sure, if I’m determined NOT to take my business global, then none of this will be of interest to me regardless. But if I’m on the fence, or if I’ve never considered “expanding globally” per se but could benefit from accepting international payments all the same, then suddenly this is a campaign that resonates. Remember: don’t ask people whether they need your product or offer. Just tell them what it can do for them. This entry was posted in B2B Marketing, Copywriting, Creative, E-mail, email marketing and tagged b2b lead generation, cybersource, email copywriting, email creative, email marketing on December 28, 2010 by Howard Sewell. I don’t disagree with your logic, Howard. A good salesperson never asks a question that might be answered “no” and never asks a question if they aren’t pretty sure how the prospect is going to answer. That said, you can avoid a rejection by leading with the offer, not the product. Don’t ask people if they want to market overseas (using your example). Instead, lead with the offer of a free report on how to do business overseas. That’s a lot easier to accept and digest. Thanks for the comment, Otis. I agree wholeheartedly with your suggestion of leading with the offer, but that alone doesn’t mitigate the damage of asking a Yes/No question.